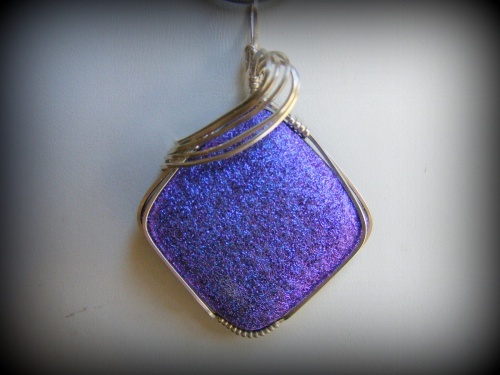 This pretty dichroic glass handmade piece has a rough front texture as opposed to a shiny glazed surface - makes it more earthy and a bit less flashy if it weren't for the brightness of the purple. Designed with sterling silver swoop and frame. Piece measures 2" from top of bail to bottom of pendant and 1 1/4 wide. Comes with a sterling silver snake chain.